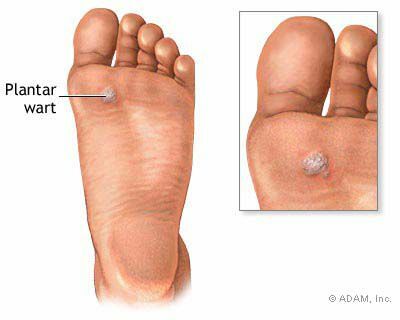 Warts are a common foot problem. Unfortunately, warts are easy to contract and spread easily which is why they are so common. Most people get warts from walking barefoot in public places or outside. Places like the gym, locker room, public pool are thriving environments for warts. Walking barefoot outside in the soil and even in your own house with pets can cause you to get warts. Warts are a virus that thrives in warm, moist, dark areas. Your shoes can be a breeding ground and why it is so common for people to have multiple warts on their foot. You can pick up the wart virus through tiny cracks in your skin. Warts can be stubborn and frustrating to treat. Prevention is key when dealing with warts, and it's easy. Always wear shoes! If you are in a public place, in a hotel, even in your own house you should be wearing shoes. If someone in your house has warts, you should clean your shower or bathtub with a disinfectant after each use. While warts can be frustrating and stubborn to deal with, we have a painless and effective treatment option. There are different ways to treat warts. Freezing is an old school approach. The down side to this treatment is it can be very painful and is not recommended for children. Pain, skin irritation and swelling are common side effects to freezing warts. In addition, cutting out the wart is another option for warts. However, like the freezing, it can be very painful. It is very difficult to isolate only the infected skin and not cut any healthy skin cells. Pain, skin irritation and scarring are common complaints. At Family Foot & Ankle Specialists, we use another, painless approach to removing warts. Our removal process starts with the doctor debriding the wart all the way to the root. This is a painless process and is similar to high powered nail file. Then, we apply 70% Salicylic Acid. Next, we cover the wart with Elastoplast and leave it on for 3 days, without getting the area wet. Then, we remove the the Elastoplast and apply our Wart Kit. This entails apply Formadon and 40% Salicylic Acid patches to the wart every day for 2 weeks. We also advise the patient to use Mycomist, a powerful disinfectant, to clean the shoes and socks and prevent reinfection. This whole process is painless and simple. Patients need to see the doctor at the beginning of treatment and again so the doctor can check the treatment. The patient is free to continue the painless treatment at home. This process does not have any side effects, it is pain free, and there is no down time. This treatment is recommended for children and adults alike. If you have a wart that you have tried to get rid of but can't, please visit our office and learn how we can treat your wart painlessly.